The weather continues to be very cold. Patients coming in reflect the cold temperatures and the problems created for wildlife that depend on insects for instance for survival. The Common Nighthawk is a member of the Night jar family. There have not been studied well and therefore many questions remain about their life history. 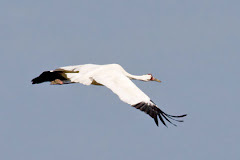 They eat only insects and accomplish this while flying with their huge mouth open. Dependent on insects this species will have a hard time surviving when cold weather limits the insects available to them. We have had several admitted suffering "migration exhaustion". Migration exhaustion is the term used either during migration or immediately following. Nighthawks winter in South America according to most references. At the end of that long trip to North Central Wisconsin they are expecting a bounty of mosquitoes and other flying insects to greet them. That has not happened this year. Birds that eat flying insects such at Purple Martins, Barn and Tree Swallows and Nighthawks unfortunatley are beginning to suffer from starvation. 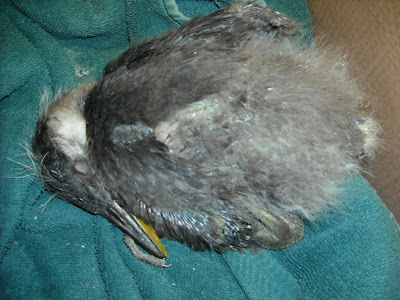 In wildlife rehabiliation we are the first to see problems that occur with wildlife. 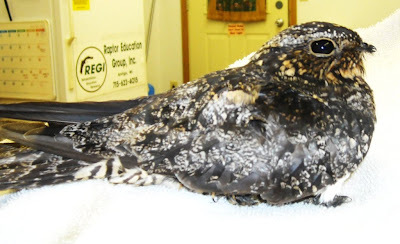 Nighthawks can be a challenge to feed in captivity. 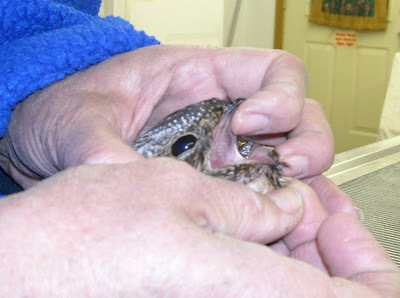 The female Nighthawk in the photos was first fed baby food meat when she was in critical condition and is now being force-fed pieces of beef heart with supplements as well as insects. 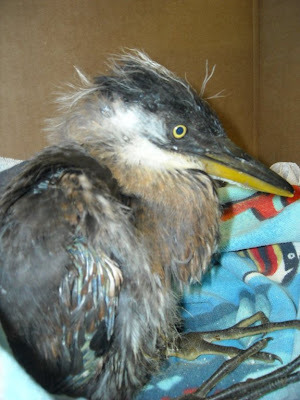 (Photo: Just admitted Great Blue Heron Chick is cold, tired and hungry. On Saturday evening we admitted a very young Great Blue Heron chick. Weighing in at just a pound this little one fell from the Cathedral Pines Rookery. This area is old growth pine and hemlock from historic Wisconsin. It goes without saying that the trees are very tall and thus the fall to the ground long and very hard. Our thanks to our friend Leslie Stewart for finding him and transporting him to REGI. The chick has recovered well as evidenced in the photos. He is now eating well, making up for lost time during the falling incident. He eats minnows, beef heart and mice. The adult herons "predigest" the food for the little ones and then regurgitate it back at the nest. It tired to get my interns to at least chew the food items first, but they balked at the suggestion. :) We do try to provide food that is as normal as possible for our patients, but for this one we will stick to pounding the mouse parts and beef heart until it is tenderized. He is eating a huge amount of food, which is normal for the species. 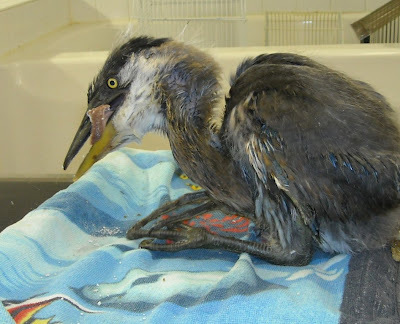 We have messages out to other rehabilitation centers in the state in an attempt to find at least one more heron chick to raise this one with. Putting him back into a rookery nest is not possible since it could result in other chicks bolting and falling to their death. We do not want to rear him as a single baby as he could well be imprinted to humans as a result. It is great to network with other facilities and we do often. Doing what is best for our patients in always our prime concern. Our Mallard ducklings have grown to nearly full size now. We have admitted several more young mallards since the photo was taken. 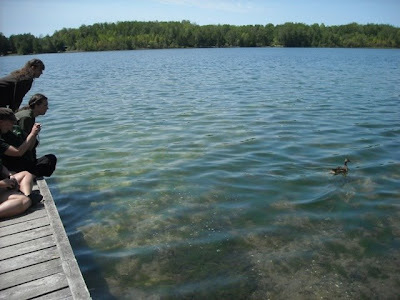 The female Mallard in the photo was patient that was hit by a car several weeks before and had a leg fracture. She had been hit by a car while leading her youngsters to safety. 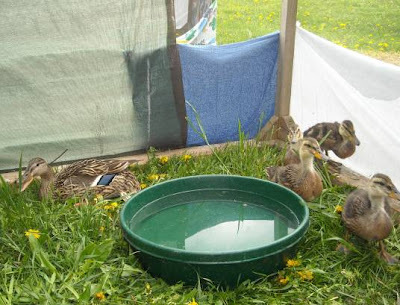 She served as a foster mom for our ducklings while in care at REGI. Foster parents are worth their weight in gold to us and the little ones they help. It also give the adult some a normal activity while recovering and before they are released. We had another weekend filled with programs. We do not yet have photos to share of the event, but will soon. We are admitting many patients per day now and unfortunately can share only a few of them on this blog. But stay tuned, there will be much more to come.